All Hunter Douglas Architectural XLnt ceiling panels are based on composite technology that originates from the aircraft industry. This state of the art technology results in extremely flat ceiling panels. Pre-coated aluminium skins are roll-formed and integrated with honeycomb reinforcement and aluminium fixing extrusions. The Hunter Douglas Luxalon® XLnt Ceiling system combines the latest technology with efficient manufacturing techniques, high quality, extremely flat and extra large sized ceiling panels. The smooth and uniform effect achieved with a Luxalon® XLnt ceiling system provides the designer with a finish that can meet even the most challenging criteria. The flatness, the size of the panels and the small joint results in a clean, smooth ceiling design. Luxalon® XLnt is suitable for those building sectors where a flat, monolithic appearance is required. These include corporate, transport (airports, metro, bus & train stations) retail, leisure, public space, hospitality, healthcare, education & residential environments. Luxalon® XLnt Ceiling systems are ideal for high quality ceiling designs where a smooth and uniform finish is a prerequisite of the design criteria. Luxalon® XLnt Ceilings have been used by leading architects in prestigious projects all over the world. The Hunter Douglas XLnt range of flat metal panels, are available in a range of standard colours that are suitable for most applications. For further information on ceiling types and the special finishes and colour ranges that are available for specific projects please contact our sales office. 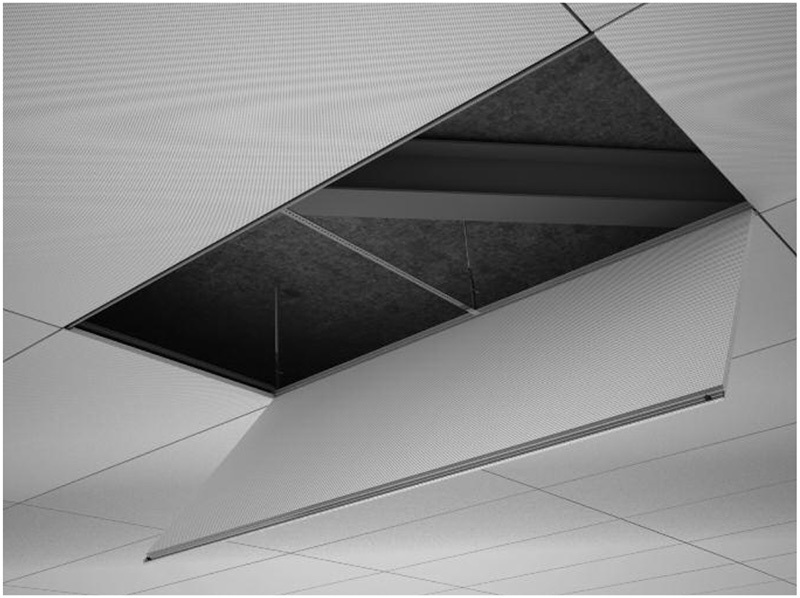 Luxalon® XLnt ceilings are used in applications where the architect is looking for a flat monolithic look. The large panels in sizes up to 1250 x 2500mm provide a smooth uninterrupted plane. The ceiling has a narrow 12.5mm wide joint around each panel. The panels are installed as a hook-on system with swing-up/ swing-down mounting. Each individual panel can be opened/demounted for easy access to the services and installations within the plenum. The acoustic comfort in an office space, school or public building contributes to our well being as poor acoustic performance can affect health, communication, safety, productivity and learning. Hunter Douglas high performance acoustic ceiling products are the best solution to deliver outstanding acoustic performance, comfort and an aesthetically pleasing environment. With the Luxalon® XLnt system an absorption value (αw) 0.75 can be obtained, depending on the ceiling and panel configuration..